I really really want to get back to sewing. But for some reason, I really really can't. 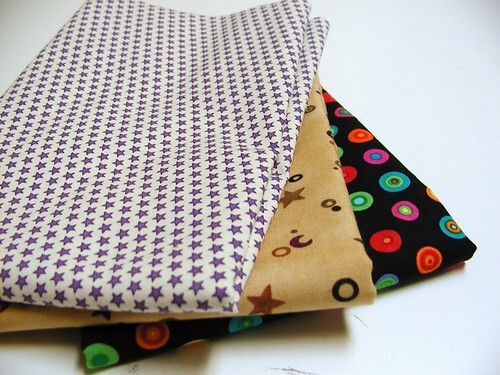 Because I can't sew, I did what any normal person would do and...bought fabric. Here's a fat quarter pack of Michael Miller's Ginger Blossom. I got it in part because the colors are not my usual colors and I'm trying to branch out. 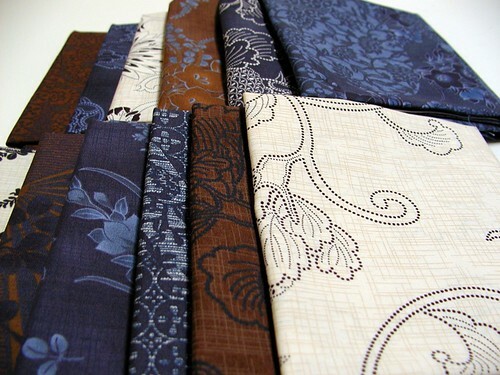 And here's another fat quarter pack, this one is Hoffman's Kasuri Japanese Country, yukata-like fabrics. I've planned pen sleeves for some of these. And these bright beauties. I got these during my "mental health" trip to the local quilt store. I didn't have any particular projects in mind, so I got colors I don't normally get. Except for the green, I always get green. These 3 have an actual plan! I'm making more tote bags, 2 for a charity auction and one for a friend's birthday. Figuring I needed to do something to jump-start my sewing, I decided to join in to Finny and Donk's Sew Along Challenge. 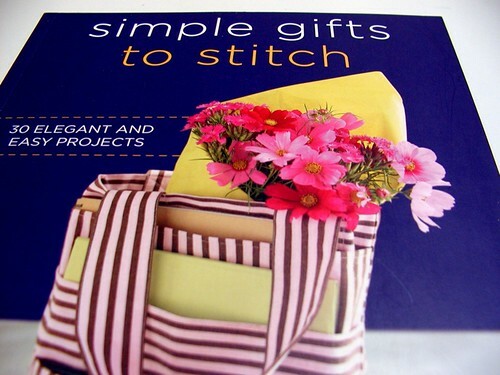 They're using Simple Gifts to Stitch for project ideas. First up is a pintucked table runner, I like the sound of that. I'm thinking I don't need to buy more fabric for that, I should have stuff in the stash, but you never know (wink). My book came on Monday, so I can get going any second now. Yup, I could. I'll now show you what I have been working on. Did you notice how this doesn't seem to be sewing-related? 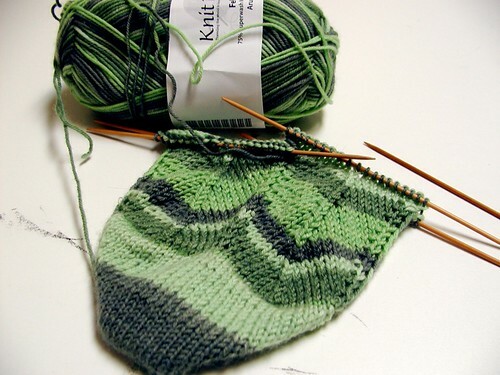 I decided I must have new hand-knit socks, so I'm working on these Jaywalkers, except I'm doing them toe-up. Getting to this point has been a huge challenge, although it doesn't seem like it should be. First, I learned how to do a short row toe. Then I perfected my short-row toe by re-knitting it about 5 times with different needle sizes and numbers of stitches. Although I usually am religious about gauge swatches, for some reason I decided it wasn't necessary. Several toes later, ones that fit only the cats, and I decided to swatch. Finally, something that fits my foot! Oh, and since I'm photo-heavy on this post anyway, I'm going to throw one more in. My new dolphin case! It's a Clover case, they say to use it for accessories. I found it on clearance at JoAnn's. I'm using it to store my size 0 dpns and the yarn for my socks. Those toothpicks break so easily, I'm hoping this will keep them safe. 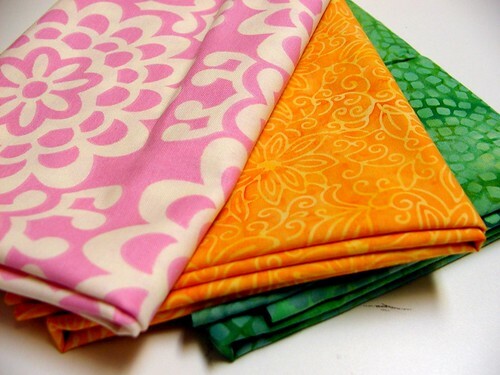 Yummy fabrics. My local quilting store just closed, I almost cried. 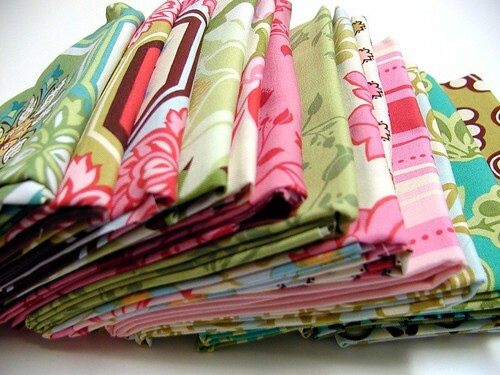 I splurged on a big bundle of feedsack fat quarters about a month ago... and I am afraid to do anything with them! they are just to pretty and nice all stacked up on my shelf.